Pyrogens are fever-causing agents. Endotoxin is a type of pyrogen and is a component of the exterior cell wall of Gram-negative bacteria, like E. coli (see image). Endotoxin is a lipopolysaccharide or LPS. 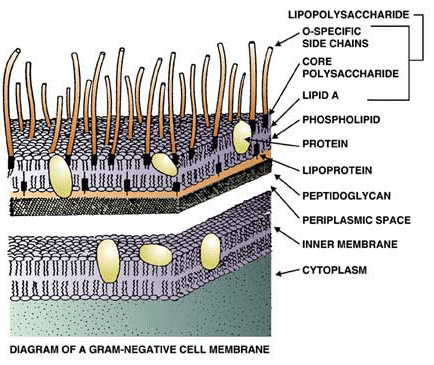 LPS consists of the lipid A portion containing fatty acids and disaccharide phosphates, core polysaccharides and the O-antigen (see image). The lipid A portion of LPS is the cause of the molecule’s endotoxin activity. While lipid A does not directly harm any tissue, the immune cells of humans and animals alike see it as an indicator for the presence of bacteria. Thus, these cells stimulate a response that is meant to fend off the unwelcome intruders. This reaction is entirely innate, i.e. no previous exposure to endotoxin is required. Furthermore, it may intriguingly serve in keeping our beneficial intestinal bacteria inside as much as in preventing major entrance of pathogenic bacteria from outside. Due to the severe consequences of an infection, an injectable healthcare product such as a vaccine or intravenous solution must be sterile or free of live bacteria, but the manufacturing process to kill any bacteria can result in release of LPS or endotoxin into the product. Just as with a bacterial infection or sepsis, if sufficient endotoxin gets into our blood stream or spinal fluid we can develop fever, shock, and organ failure. In extreme cases, it can even result in death. Therefore, injectables or implantables, products that come in contact with the blood stream or spinal fluid, are tested for sterility (the absence of live bacteria) as well as endotoxin. Testing for endotoxin helps assure product quality and safety.